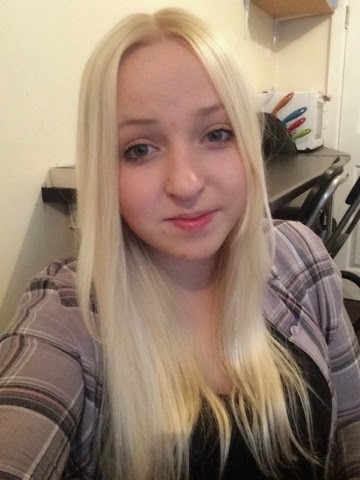 I have always been reluctant to go to the hairdressers and can only think of one occasion when I actually went and trusted them with my hair, and it wasn't pretty! To be honest, I have been fairly lucky as my mother was trained in hairdressing and my sister went on to be a successful stylist in London for four years and so I have had a lifetime of free hair-cuts and colours. Yet when I moved away to university it was time to learn for myself. Although i'm still learning how to cut it correctly (my sister was horrified when I explained I've been using my kitchen scissors to execute a quick trim - this I don't advise), I seem to have mastered colouring if I don't say so myself. I buy all of the products included in this post from PAULS hair boutique in Manchester, and SALLYS when in Grimsby, Your area should have a local hair-product wholesalers. A bottle of creme peroxide, seek advise from the staff on which percentage you would require for your desired hair colour. And your colour. I use Koleston Perfect 12/0 Special Blonde (for Blonde hair of course). Check the Wella website here: Koleston. A pair of latex gloves to avoid any dry skin. An old towel / item of clothing to wear. Step one: Squeeze around a third of the colour tube into the mixing bowl. 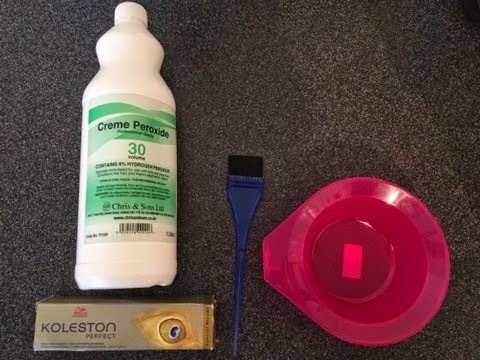 Step two: Add in the creme peroxide, enough to cover the base of the tub. Step three: Mix in the two products using your brush to stir the two together. Step four: Part your hair using bobbles and hair grips to reach the areas you desire to apply the dye to. 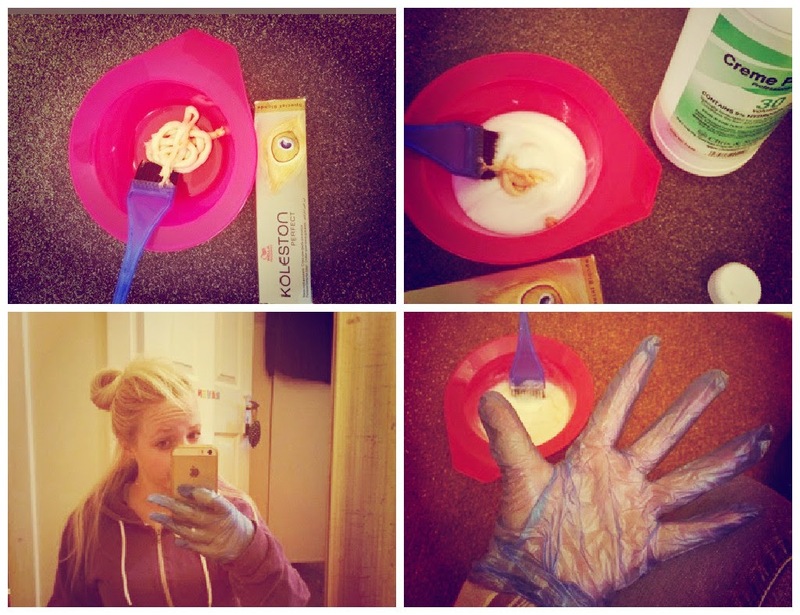 Step five: Put on gloves to avoid any direct contact with skin, and using your brush, simply paint mixture onto hair. Step six: Repeat step four and five until you have covered all desired areas. Step seven: Leave products on for 30 minutes and then wash out in the shower as you would normally wash your hair. And there you have it! A quick tip: it does work much better on dirty / greasy hair. Remember if you are unsure of anything definitely ask at your point of purchase. No question is a silly question, especially when your hair is on the line. Although I am not in any way, shape or form a professional, nor do I claim to be, I hope I have been helpful! I personally think it is better than any box dye you can pick up in Wilko's. The Koleston has a conditioner in with the colour too and I can assure you my hair is always in a good condition without using any sort of expensive products.